Venus Vs. Mars. Which is perfect for terraforming? Unlike Venus, which rotates once every 243 Venusian hours on its axis, Mars revolves once every 24 Martian hours and 37 min, which is very similar to the Earth. The only thing that Mars is in disadvantage in comparison to Venus, is that it has a diameter of 6.792 km, which is small compared with the Earth and Venus, these latter two being similar in sizes. Venus' diameter is 12.092 km (only 650 km less than the Earth). If you were to ask which of the two planets would be suitable for any life form, which would you choose? My guess is that Mars. This planet with an atmosphere, be it thin, consisting of carbon dioxide, is more like ours: it is not always covered by clouds like Venus, and temperatures oscillate between -143 ° C and 35 ° C, and the average temperature of Venus is 480 ° C.
Besides this, I think it's easier to live in cold weather than hot. Here on Earth we know that it is much easier to protect yourself from cold than warm. When it's hot, you can undress yourself all naked but you can not escape the hot weather. If it's cold, you can wear thicker clothes and adjust your body temperature. For Mars we represent aliens. We can change the future of this planet, because we got right on it thanks to our technology. We know that there are not life forms on Mars and do not even know for sure if this planet hosted this in the past, but we know that we have the ability to do it, once we studied it and we have got there. How? I think it's simple. We discovered life forms on our planet, that can live in very difficult conditions, similar to those on Mars. It is the microscopic microbial life: small creatures called bacteria and archaea. A type of photosynthetic bacteria called cyanobacteria can form the first molecular oxygen in the atmosphere, which could raise about 10% oxygen on the planet, allowing ozone and oxygen to form, using creatures to evolve. In future missions, we can transport these bacteria there to monitor their behavior in that environment. I think we've reached a level of knowledge of the red planet, in which we can experimenting various ways of how we can revive the planet. 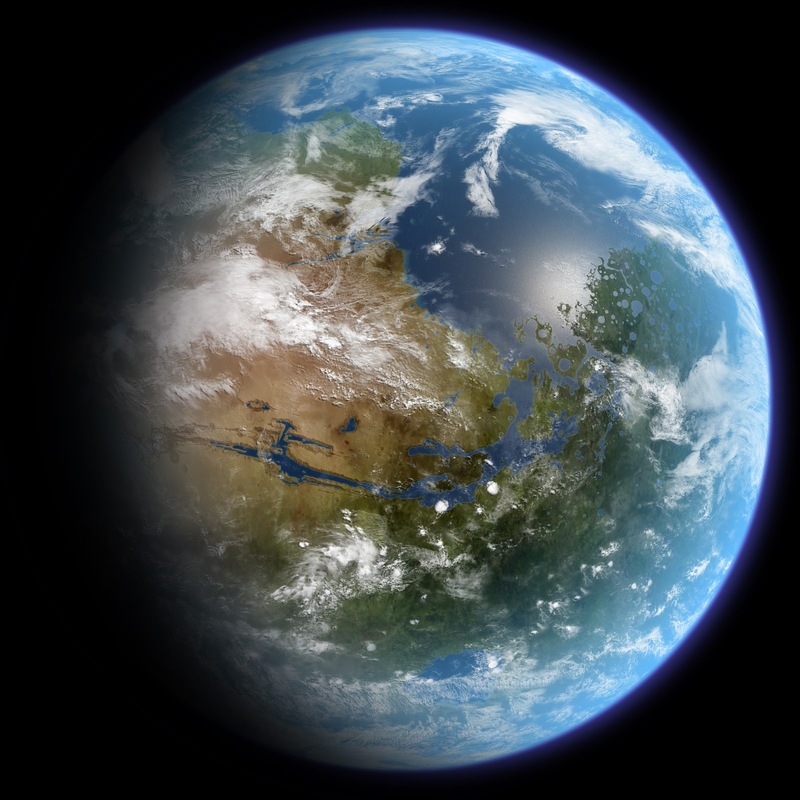 Slowly, through long programs, we can terraform Mars into something unrecognizable. 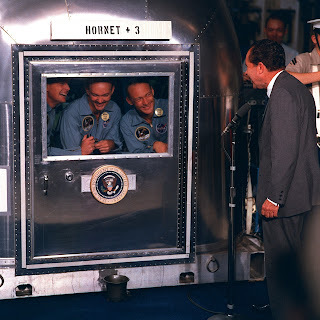 Photo above: quarantined Apollo 11 crew and President Richard M. Nixon. Credit: NASA. 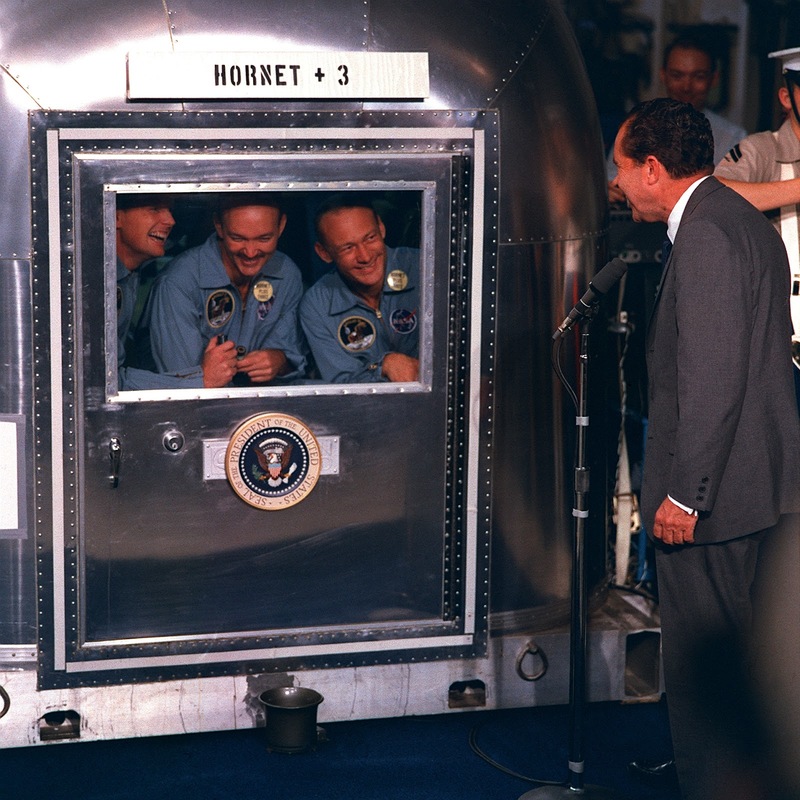 We all know that the Apollo astronauts when returning from the Moon, were taken first to a "cell" in quarantine. This is because they went an alien environment, where they could borrow various substances which were not on Earth. This practice continued for two more Apollo missions, Apollo 12 and Apollo 14, before it was proven that the Moon is barren of life. Later, the quarantine has been cancelled. Same, but conversely, it can happen on Mars, and exclude quarantine. There we can deliberately "infecting" the planet with microbial biological factors that can transform it. In a very long process, these substances can act as a "disease" called life, which may cover the entire planet. Maybe Mars really needs those substances sent from here. Have you thought of that? Either way, I think with manned base there, could be more easily there than on the Moon, where the atmosphere is totally absent. How hard is to terraform Mars? Other rocky planets with an atmosphere besides Mars, in our solar system are Venus and Earth. Venus is closer to the Sun than we are, so it's a hot planet, and Mars is farther from the Sun than we are and so there is much cold than here. Earth therefore lies between the two planets, Venus and Mars, both with extreme temperatures, but Earth with temperatures just right for life. To reach Mars would take 6 months traveling with today's technology. In an hermetically closed module, would be transported microbial creatures found on our planet that could survive on Mars. I'm surprised that so many rover missions on Mars, but no microorganisms were transported to be left there. This would be essential to discover if indeed this planet can sustain life. I think maybe NASA is counting on finding life there, without external influences, because after that, if it finds something, we will not know whose it was. This compares with the question: whose is my child? It is clear that where there is no water, a plant is not good for anything, it dries and dies. A mission of this kind would cost millions to no results. But if we consider other methods, can we have a result. I think even of the terraforming from inside. I do not know if we have created the conditions on Mars, here in laboratories on Earth. It should be built some large ermethical spaces,, in which there has to be soil, air and temperatures to match those on Mars. I do not think NASA does not know these things with so many missions performed on the red planet. 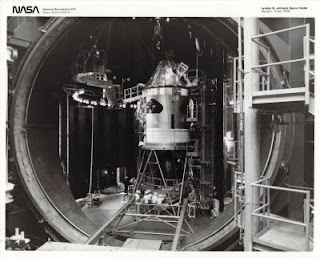 Vacuum conditions to simulate the operation of Apollo module. Credit: NASA. We have the necessary data for creating a Martian environment, as it was created a Moon environment for Apollo astronauts, but I think this task would be more complex. Creating environment of Mars, involves in my opinion, a very hard work, because you have to create a certain amount of air substances, not as the lunar vacuum. Pantelo Pandeli •none. you have to reduce the intense UV on mars.HOW?PLANETS WITHOUT MAG. FIELDS CANT DO IT.a small base might??? 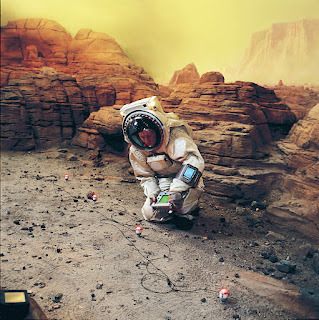 Ken Robinson •I agree that Mars would be easier to terraform. I recall reading an article in the Journal of the British Interplanetary Society, probably written in the 1980s (can't remember the title or author of the article) which gave some interesting ideas on how to terraform Venus. One idea involving hitting the planet with small asteroids on tangential angles to speed up its rotation. I don't recall what the article suggested for dealing with its atmosphere, though I suspect it involved some mass-scale chemical reaction to reduce the amount of carbon dioxide, orbiting shades for cooling, and possibly the introduction of plant life if sufficient cooling were successful. Anybody else remember reading this article? In any case, Venus may be beyond our current technology to terraform or at least beyond our economic abilities at the moment (as well as reasons for doing it). I don't believe it was Martyn Fogg who wrote it, though he wrote much on this subject. Another interesting aspect to this topic is, should we even do such a thing? Should we preserve these planets as we find them, or change them for our uses? What would we do if we found inidigenous life on them? Would it matter if only microscopic life were found? There are a lot of ethical issues to cover and consider. Thanks for posting. It's a fascinating subject. 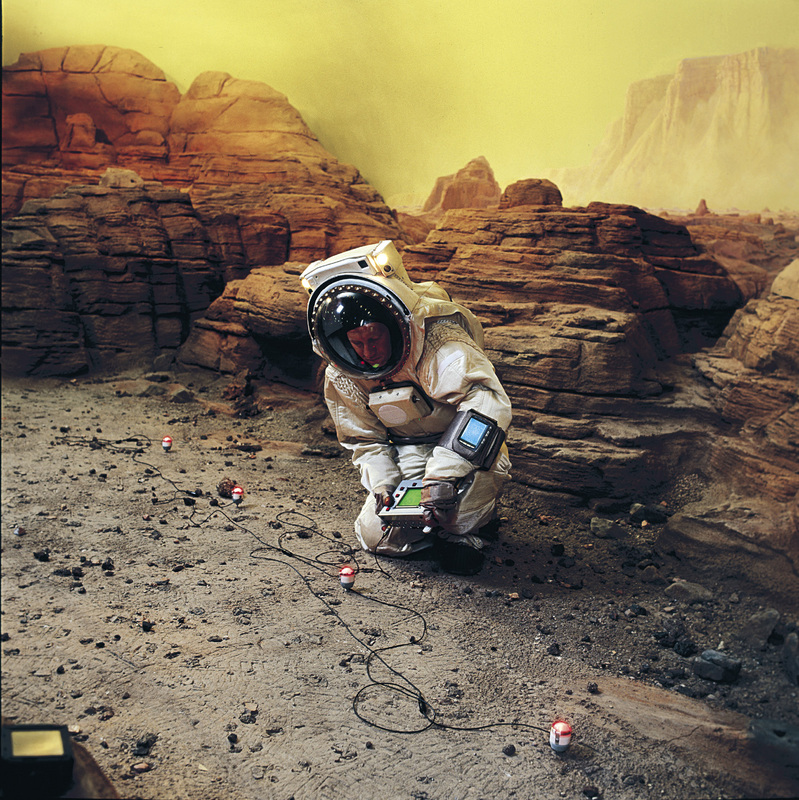 Patrick de Luca •It'll take centuries to terraform Mars. The problem is that you have to make the temperature rising by adding CO2, and to have the amount of CO2 getting down to have a breathable atmosphere. Robbie Robinett •Venus is tooooooo hot. Even metals melt on its surface. Granted Mars is cold, but if we work on underground/cavern colinization protocols and slowly construct domes to make areas of the surface habitable. That's the ticket. Dome structures would also be less prone to damage in the severe surface dust storms we have observed over the past 50 years... the iron in the soils could be useful in construction, the sans for building the domes, and if near enough to the polar caps, the ice could be warmed for drinking and other hydro-projects. If we stop dreaming and being futurists, we may as well pull the covers over our heads and cease to think. Michael Marston •Mars... if you haven't yet read them, read the "Mars Trilogy" by Kim Stanley Robinson... good reading, good science. Branislav Lugonja •If You have technology any planet is suitable. Charles Radley •I do not understand your question? Do mean what is most likely for where life evolved? Or what is the best place to support human life in the future? For human space development, NEITHER planet is suitable. The Earth's Moon is the place to begin, from there habitats in space can be built far more cheaply than building habitats on Mars or Venus. Joshua Nelson •Charles, that is not the question he asked. The question was that given the two places, which is more suitable for life in general. For reasons we don't quite understand, Venus has almost no water, yet the Earth has lots of water and Mars has a minor but measurable amount stored underground and under the ice caps. This makes Mars much more suitable to lifeforms than Venus, as far as we know. Why do I say as far as we know? Because we can only judge what a suitable location for life will be based on life here on Earth. And on Earth, we need water. Mars has water, Venus has virtually none. However, we can't easily judge how suitable a location would be for forms of life we have never seen. Science Fiction authors and "Astrobiologists" have proposed many alternate metabolisms for life revolving around methane, silicon, and many other elements that would enable life to exist independent of the presence of water. But until we find such life and can study what requirements it needs to survive, the surest answer we can give you is to "follow the water" when looking for life! Hope I helped answer your question! One cool thing about Space is there are still so many unknowns. Even 10 years ago we thought planets around other stars were relatively rare, but the more we search, the more likely it seems that almost every star has a handful of planets, each with its own unique conditions that may or may not support life. Who knows what we'll discover? Charles Radley •I do not understand why it is a binary choice between Mars and Venus. the Moon is better than either. James Brown •I strongly disagree with the moon. It is missing so much. The original question here was which was easiest and most practical to terraform. Mars by by far. There is strong evidence that Mars has vast quantities of water. Some say that a flat warm Mars would be covered by two hundred feet, Earth a few miles, and Venus a few microns, our moon even less. Venus and our Moon do not hardly turn. I can make a strong argument to prove that life first developed on a very wet warm Mars before Earth was cool enough to support life, and it was brought here as soon as Earth was cool enough to support it. It was also delivered here millions of times before and after. Our Moon only has most organics in parts per million except possibly at the poles, and a micro thin layer at the very surface. Our moon is not far enough to protect mankind from most things that could kill everyone. Mars is far enough away until we have travel fast enough to go to other star system. Mars mostly just needs warmth. The moons of Mars can help that greatly, in fact they can give Mars an economic benefit in interplanetary commerce. • I strongly disagree with the moon. It is missing so much. The Moon has all the resources needed for supporting humans and for supporting space manufacturing. It is close to Earth and easily accessible with short round trip time and low delta vee requirement. --The original question here was which was easiest and most practical to terraform. Actually no, you did not mention terraforming. Now I understand where you are coming from. Terraforming is a very difficult and expensive process. Developing the Moon is much faster and cheaper. --Mars by by far. There is strong evidence that Mars has vast quantities of water. The Moon also has plenty of water. -Some say that a flat warm Mars would be covered by two hundred feet, Earth a few miles, and >Venus a few microns, our moon even less. The Moon might have less water than Mars, but it has plenty of water for our needs in the foreseeable future. The Moon is the best place to start space development. If millions of people are living in space, then it might be worth looking at Mars resources to augment Moon resources. But that will not happen for at least a hundred years. The big problem with Venus is the very deep gravity well making take off and escape from there expensive. Similar problem with Mars, but not so deep. --Venus and our Moon do not hardly turn. That does not matter at all for space development. > >cool enough to support it. It was also delivered here millions of times before and after. Maybe true, but not relevant to future space development. > Our Moon only has most organics in parts per million except possibly at the poles, and >a micro thin layer at the very surface. That is completely wrong. The top ten feet of lunar regolith (3 metres) are rich in volatiles, including organics, which can easily be extracted by heating the dust to a few hundred degrees. The qunatity of volatiles in the lunar regolith is billions of tons. > Our moon is not far enough to protect mankind from most things that could kill everyone. Again, completely untrue. I cannot think of any disaster which would eliminate life on Earth and also destroy the Moon. The exception would be a "Gamma ray burst" which would fry the entire solar system, including Mars. > Mars is far enough away until we have travel fast enough to go to other star system. (beyond Mars) to access the huge supply of raw materials out there. > Mars mostly just needs warmth. The moons of Mars can help that greatly, in fact they >can give Mars an economic benefit in interplanetary commerce. Mars is lacking many things, it has no breathable atmosphere so a pressurized life support system is needed just like the Moon. It has extremes of temperature so thermal control needed just like the Moon. The atmosphere is bathed in lethal radiation, so shielding needed, just like the Moon. Mars is a long way from Earth so resupply of medical supplies and spare parts etc will be very difficult. Schickard through a telescope November 8, 2011.